"My father told me when I was five or six years oldhe grabbed me and said, 'the trumpet is the greatest jazz instrument.' And I think he was right," says Randy Brecker, a trumpeter known the world over, it seems, regardless of the style of music he plays, inside and out of the jazz world. "It's a love-hate relationship. Some days I want to throw it out the window. But I still love the sound of the trumpet, after all these years. It's just a thrill to hear it played well." Brecker has been playing trumpet, quite well, thank you, for decades. 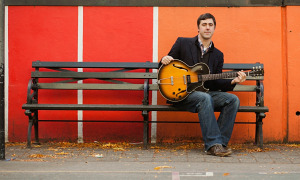 He started at the age of eight and was gigging in his native Philadelphia as a teenager. He's always busy, either on his own projects or with others, by not only leading his own fine groups, but also by being part of important bands in the jazz, pop and rock worlds for decadeslike Blood, Sweat & Tears, Horace Silver, the Mingus Big Band, Dreams and the Brecker Brothers with his saxophone playing brother and now jazz icon, Michaelto name only a handful. There can't be many music fans who haven't heard his strong sound. 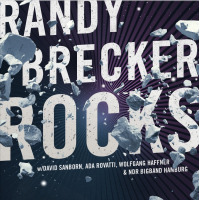 According to Breckers's website, he has appeared on well over 900 recordings. Blues artists like Koko Taylor, Luther Allison, John Mayall, Johnny Winter and B.B. King have used his sound to embellish their music. Pop and Rock music? Try Carly Simon, Paul Simon, Frank Sinatra, Steely Dan, Elton John, Ringo Starr, Dave Matthews, Tina Turner, Aretha Franklin, Rickie Lee Jones, James Brown, Joe Cocker, Frank Zappa, Bruce Springsteen, Eric Clapton, Luther Vandross, James Taylor, and Lou Reed. That doesn't cover it all, but one gets the picture. Brecker recounts a trip back to the United States earlier this year from Cologne, Germany, where, with the WDR Big Band, he played a musical tribute to a close friend, the late Hiram Bullock, with arrangements by Michael Abene, a friend going back to his days playing with Maynard Ferguson in the 1970s. "I was flying home. The whole way home I listened on my iPod to old Maynard records that featured some of Mike's old arrangements... The sound of the trumpet, the sound of Maynard, still shakes me up. I still love the sound. That keeps me going." Brecker is also constantly writing and working up different projects that will place him in different settings and have different challenges. He likes that. 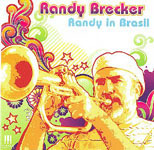 The latest recording project to come to the fore is Randy in Brasil, a record done in Brazil with musicians he had come to know over the years. The project was developed about three years ago and comes to realization now on MAMA Records. It was done in Brazil and features compositions of Joao Bosco, Ivan Lins, Gilberto Gil and Djavan. They're not of the Jobim generation, but have taken that example and run with it, each in their own direction, to great success in their homeland. "They're my generation or maybe a little younger. They've all been around for a long time and are household names in Brazil," says Brecker. The CD idea a few years ago was "a fluky thing," he says. In Japan, visiting a Brazilian club, he met percussionist Marco Bosco, who was working with Sadao Watanabe, but mentioned he was moving back to Brazil and starting a record company with Ruria Duprat, a producer/composer/arranger who had his own studio. Brecker was asked if he'd like to record for them. It took a few years, but it happened. "I decided to go down there, sight unseen. It sounded, at the very least, like it would be fun. I'd always wanted to record in Brazil. I did a semi-Brazilian record (Into the Sun, Concord, 1996) about ten years ago. It won a Grammy. I've always, through Eliane [his ex-wife and pianist/composer, Eliane Elias] and Amanda [his daughter, Amanda Brecker, now also a singer/composer] had a deep connection to the country. Even before them, I went there a lot. I think 1979 was my first trip with the Mingus Big Band. "So I went down there and helped choose the tunes... I stayed for a couple days and recorded everything. It kind of disappeared for a while, because the record company never got off the ground. I think they had one release. For several months, everybody disappeared, and I almost forgot about it. But then I started e-mailing Ruria, and slowly but surely, by e-mail, we put the thing together, mixed it, and I started looking for a deal for it here. Summit/MAMA was kind enough to be interested and put it out. "Now it's coming out in Japan, on the JVC/Victor label... So it's going to get worldwide release. So I'm happy about that." "Pedro Brasil" kicks off the CD and pretty much sets the mood for the recording. 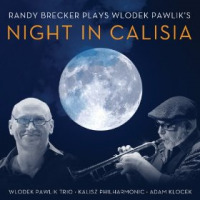 Bright and lively, Brecker and saxophonist Teco Cardoso play over a light cushion of rhythms, from percussion instrument, guitar and keyboards. 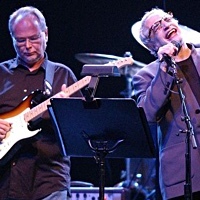 Brecker's tone and articulation are typical of what people have come to know and enjoy. Crisp, clear, agile. As Brecker notes, it may seem simple, but repeated listening shows that Brecker is playing through a more intricate musical maze. He makes it look easy, like some outstanding athletes can do. The tunes have places where wordless vocals float across the melodies and other items have been added in the production that lend to a velvety ambiance. "I think this CD, due to the fact that I actually had a producer [Duprat] in charge, showing me the ropes, telling me what to do, etc., was kind of a unique experience for me. Hopefully, it will help sell the record," says the trumpeter. "I thought he did a really good job of thinking through all the tunes. He obviously put in a lot of time writing arrangements for woodwind sections, having a singer on a couple tunes, finding samples and adding little things here and there that are signs of a good producer. Plus, he did a really good job mixing the thing, though I had a hand in that." Duprat, says Brecker, is a well-known producer and one of the foremost film writers in his country. 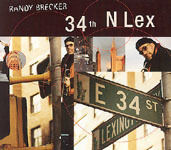 Brecker also penned a few tunes for the album. "Guaruja" is a ballad that shows Brecker's strong and inventive voice on his instrument. Unrushed, he executes his statements with passion. "Sambop," as the name hints, has flavors of samba and bebop expression. Its faster pace allows Brecker to display his considerable chops at times, and his romanticism at others. The songs stand up with those written by the Brazilians and are a fine fit in the Randy in Brasil mix. Says Brecker, "The basic tunes were all written out. It was tightly arranged. Then I improvised on the themes... As accessible as some of the tunes are, they're at the same time difficult. There are a lot of chords. There are a lot of rhythms you have to hit. The melodies themselves are all pretty hard. A lot of the melodies were sung, and to translate a lot of vocal tunes into instrumental music takes some thought. They were all difficult tunes. If anything, this is one of the more difficult projects I've ever done, just to keep up with the harmony and play the right notes. "There's some pretty complicated stuff, and there's a lot of notes on there, that's for sure. It's somewhat typical Brazilian style, but I am hoping that it is a little more accessible and will get a little more [radio] play than a lot of my projects. I think they are accessible, but they fall between radio formats and have never gotten much radio action." The musicians are all Brazilian. 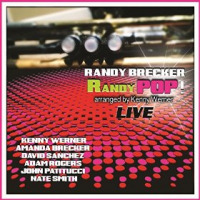 Brecker selected guitarist Ricardo Silveira, a friend he's recorded with in New York on different projects. "On my very first trip to Brazil, I spent a lot of time with Ricardo in 1979. I stayed in touch. He's also one of the most famous instrumentalists in Brazil, so I was happy to get him on the recording." Others he had heard of, but never met. "All the sidemen are very famous in Brazil from having played with a lot of these composers. They're kind of the equivalent of the [popular U.S. studio musicians] Steve Gadds or the Anthony Jacksons." 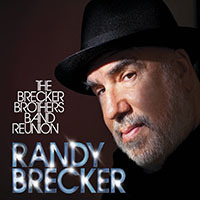 Whether Brecker will tour in support of the disk remains to be seen. There's interest in behalf of the players. 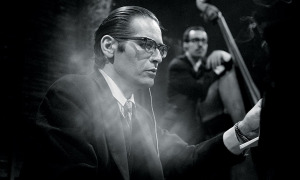 But that music was recorded, Brecker is always moving. There are always more things to be plannedmore irons in the fire. "I've always kept my fingers in a million different things. I have two core bands. One is an electric band and one is a more acoustic band, both of whom feature my wife [Italian saxophonist] Ada Rovatti. People like Rodney Holmes on drums, Dave Kikoski on keyboards, Rich Stein on guitar. 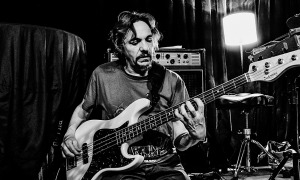 There are different bass players... We did a lot of touring last year in Germanythe usual summer stops like the North Sea Jazz Festival. I've also been playing as a special guest with other groupspeople like [trombonist] Conrad Herwig. We recorded The Latin Side of Herbie Hancock. In August I did a project in Poland with a symphony. That's coming out [as a recording]. A jazz symphonic project written with the area of Poland where my family wasthat was the inspiration of the piece ["Tyocin"]. It was written by a guy named Vlodek Pawlik. He's also a famous film writer in Poland. It was a wonderful piece, so I'm looking forward to hearing that when it comes out, with the Bialystok Symphony Orchestra. 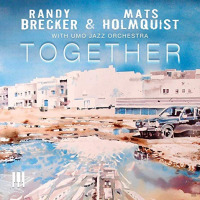 "I did a project in Japan with a brass group that did a tribute to the Brecker Brothers. That's also coming out on JVC/Victor. It was a live concert at the Hanamatsu Jazz Festival. "I did a lot of recording over the summer. A lot of the stuff will come out around the same time. I'm always writing tunes and figuring out what the next project is going to be. I'm not sure in what direction it's going to go. I've got some jazz tunes and some funkier stuff. We'll see. I'll probably put something out at the end of next year, or the year after." A lot of good musicians can't list as many happenings as those mentioned by Brecker. 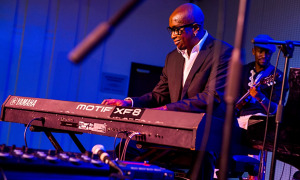 But he continues to make good music and continues to be seen in idioms other than jazz. He doesn't view those gigs any differently. 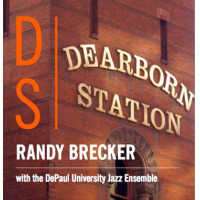 There are many facets to music, and Brecker is facile in them all. "I've been lucky, in a lot of ways. I've always diversified. I've got my fingers in a lot of aspects of the business. 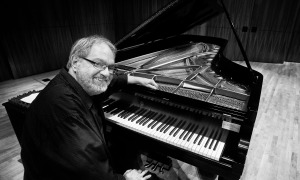 I enjoy teaching and have always done a lot of clinics and workshops and concerts at collegesworking with kids, working with college big bands and small groups. That's occupied a lot of my time. In the heyday of the studio scene, I was on a lot of records. That projected my name around to a lot of different circles. At the same time, I kept my sense of identity by writing my own material and putting my own records out, either with my brother, Mike, or solo projects."